What Did You Read the Most on allAfrica in 2018? 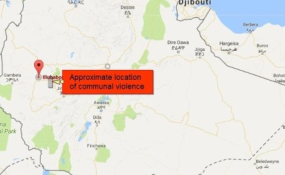 Several people were killed, many of them hacked to death, in yet another communal violence, this time in Illu Aba Bora (Illubabor) zone of the Oromia regional state in western Ethiopia, according to two sources who spoke to Addis Standard by phone. The news has been confirmed this morning by Addisu Arega Kitessa, head of the Oromia regional state communication affairs bureau. According to one of the two sources who spoke to Addis Standard, violence began in Dega and Chora woredas in Buno Bedele zone as well as in Illu Aba Bora zone, about 330 kms west of the capital Addis Abeba, on Friday October 20/2017. It started as an anti-government protest called "via cell phone messages sent out to many receivers calling for a protest against the recent displacement of Oromos from the Somali regional state," said one of our sources on conditions of anonymity. "The protest quickly degenerated into fighting, then some young people started to go around killing people and burning houses," he said, adding that "many of those who were killed and whose houses were burned down were ethnic Amharas." However, in his message on Facebook, which was written in Amharic, Addisu said that "eight Oromos and three Amharas" were killed in Dega and Chora woredas in Buno Bedele zone as a result of a "deliberate attempt by some people who wanted to instigate ethnic violence between Amharas and Oromos." Addisu also blamed the violence on forces "who want to destabilize the regional government." Without giving further details, Addisu also said those responsible were placed under police custody. Other reports from social media activists put the number of death as high as 20, however, Addis Standard cannot confirm these number. The second source who spoke to Addis Standard on his part said that properties belonging to ethnic Tigrayans were also targeted and "more than a dozen houses and businesses were set on fire." However, he added that the "dead were mainly from ethnic Oromos and Amharas who lived together in the area for decades," he said, sounding upset and with a voice shaking uncontrollably. "Many people have fled their houses and are in hiding right now fearing for their lives." The BBC Tigrinya news website reported yesterday that coffee farms and businesses belonging ethnic Amharas and Tigrayans were destroyed. Addis Standard couldn't receive pictures from the scene as internet seems to be disconnected as of yesterday. Communal violence followed by protests seems to be the latest trend in all the fresh protests seen in Oromia regional state within the last ten days. On October 11, three people were killed by security forces during a protest rally in Shashemene town, 250 km south east of Addis Abeba, in west Arsi zone of the Oromia regional state and three more people were killed in Bookeeti town, west Hararghe zone of the Oromia region in eastern Ethiopia, where more than 30 were also wounded. This was followed by yet another protest rally related violence that lasted for more than three days in Muke Turi, about 90km west of Addis Abeba in North Shewa zone of the Oromia regional state and in Gebre Guracha, about 160 km from the capital and another city in North Shewa zone, where several cars were also torched. Oromia regional state has been the epicenter of persistent anti-government protests that first began in April-May 2014, and re-started again in Nov. 2015, which went on throughout 2016 until the government declared a state of emergency that lasted for ten months. More than 600 protesters were killed by security forces during the 2015-2016 protests, according to the government's account. However, unlike all the previous protests, no one appears to take responsibilities for organizing the fresh round of protests; online Oromo activists who previously take credits for organizing popular protests have distanced themselves and other Ethiopian social media actors have continued disputing the motives behind these protests with some claiming that it is nothing be a saboteur orchestrated by members of the OLF to undermine the current government in the region led by Lemma Megerssa. But others insist the OPDO and Oromo social media activists should take the responsibility instead of pointing fingers at others. Copyright © 2017 Addis Standard. All rights reserved. Distributed by AllAfrica Global Media (allAfrica.com). To contact the copyright holder directly for corrections — or for permission to republish or make other authorized use of this material, click here.